We conclude our countdown of the best races of the 2017 Virgin Australia Supercars Championship with Supercars.com's selection of the top five. If you missed the first half, you can view it here. Saturday morning at Pukekohe had been bleak, with heavy rain on the recently resurfaced back straight making the circuit undriveable. Qualifying was cancelled and, with further rain predicted for the afternoon, there were genuine fears that the race would have to be rescheduled for Sunday. 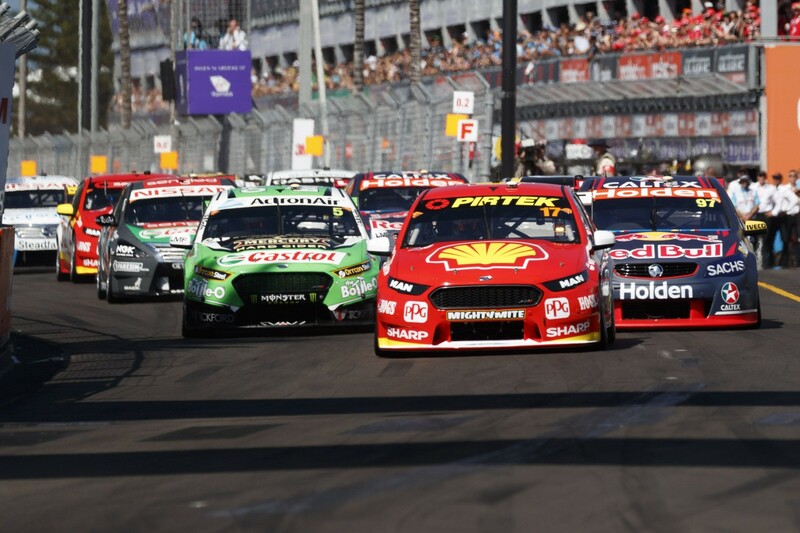 The skies held, however, and fans were treated to a thrilling door-to-door fight between title contenders Scott McLaughlin and Jamie Whincup, ultimately won by the Penske Ford. The race, though, fell to another local hero, Shane van Gisbergen, who had benefitted from confusion under the Safety Car to leapfrog the top duo and take a popular win. Winless in almost six months at the start of the day, the defending champ could not contain his excitement – damaging his car during post-race victory burnouts that raised the ire of his team. The day’s biggest drama belonged to another of the Kiwi stars, with Fabian Coulthard’s title bid coming unstuck as he rolled amid a multi-car melee triggered by Chaz Mostert. The race that put Whincup ahead of Craig Lowndes on the all-time win tally was another cracker and came with a little help from van Gisbergen. Whincup had appeared to throw the win away at the start of the final stint, running wide and allowing van Gisbergen through at Turn 2 after rejoining narrowly ahead. With McLaughlin, Coulthard and early leader Mostert on fresher tyres and closing fast, van Gisbergen let his team-mate through 10 laps from home. While Whincup bolted, van Gisbergen set about fending off the trio of flying Falcons, eventually finishing third after succumbing to Coulthard three laps from home. It was clear from the outset that 2017 would be a heavyweight battle between established champ Red Bull and rising superpower Shell V-Power Racing. The first big blow went to Red Bull as van Gisbergen snatched the Sunday win in Adelaide from McLaughlin with just three of the 78 laps remaining. Reigning champion van Gisbergen had spent the final stint closing down his rival, who had been looking for a fairytale win on debut with the Shell squad. It was a race that had the Adelaide crowd on the edge of their seats and set the tone for the battle ahead. Victory also marked an emphatic start to van Gisbergen’s title defence, having also scored the win in the Saturday contest. This year more than ever, the Bathurst paddock on Sunday night was littered with ‘what if’ stories from drivers and teams who genuinely felt it was a win that got away. Cameron Waters, Mostert, van Gisbergen, Garth Tander and Nick Percat had all been in strong positions in the closing stages of the drama-packed wet/dry race before ending up with little. McLaughlin, meanwhile, was the star of the weekend thanks to his record-setting Shootout effort, but came away with nothing after a mid-race engine failure. Just as dramatically, title rival Whincup also suffered an engine failure and, although able to limp around to score vital championship points, it robbed him of a shot at a fifth Bathurst win. Ultimately, David Reynolds and Luke Youlden triumphed. Having been quick all week, they kept out of trouble for the most part before Reynolds put the hammer down at the end. It was another Bathurst cracker. The second leg of the inaugural Coates Hire Newcastle 500 will go down as one of the most dramatic Supercars races ever. After Whincup’s Saturday error, McLaughlin needed just 11th to secure a maiden title and, having won on Saturday and scored pole on Sunday, it appeared a slam dunk. A strong start and an early lead were soon dashed by a drive-through for pitlane speeding, setting up a nervous recovery drive through the field. Another penalty followed when he clanged into 11th-placed Simona De Silvestro, before he fought back again to take the coveted 11th place just over two laps from home. The now-infamous collision with Lowndes, who had been flying on fresh tyres, came on the penultimate lap, and the penalty for that was issued as McLaughlin approached the flag. Team play from van Gisbergen helped Whincup win the race and, in the most dramatic of circumstances, a seventh title. By all accounts, it was his best yet.